I am in pursuit of the perfect cherry pie. Every one I have ever had was too sweet or too runny. Some have been mostly good but felt like some flavour was missing. I had great hopes for this deep dish pie, but sadly it was not to be. I used a mixture of sweet and sour cherries for this one, and I think the flavour profile there was good, but it seemed to cook oddly. The recipe said to cook it at 425 degrees for an hour, but I think it would have benefited from a blast of high heat and then being turned down to cook lower for longer. The result here was cherries that were not quite broken down enough - they almost had a mushroomy texture. Yes. Pretty weird when eating cherries. The flavour profile of the mix of cherries was good, but I added almond extract which I think it did not need. 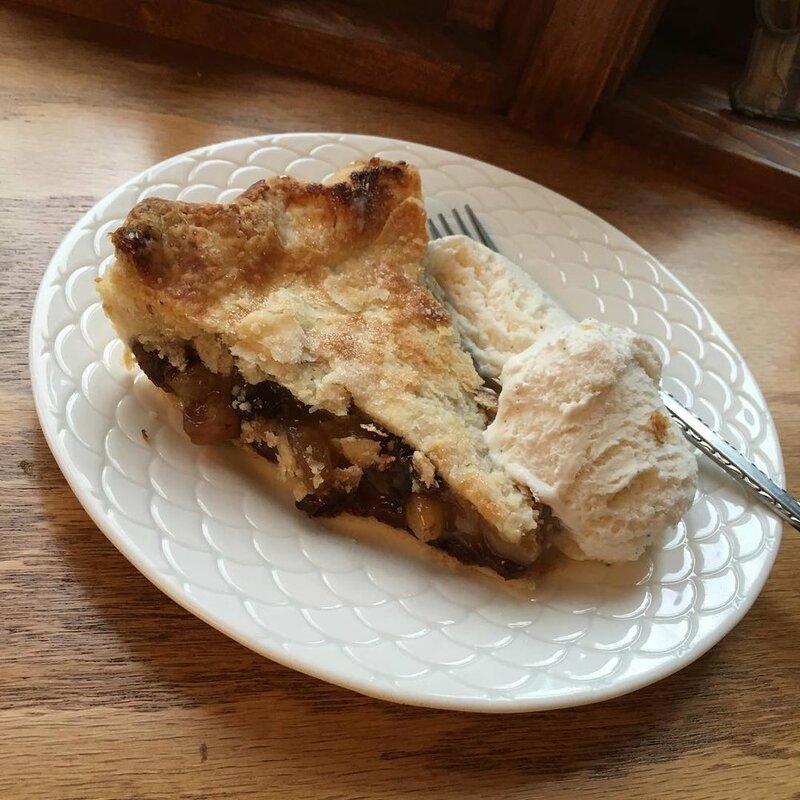 This week's pies contained some interesting ones and a lot of surprises! One of which was the 'Almost Rhubarb Pie' - basically a rhubarb custard pie - that I would make and happily eat every day for the rest of my life. Seriously it was amazing. Essentially you follow the same process as for the 'Entire Rhubarb Pie' but you only add three cups of rhubarb and then you cover it all with some eggs and milk. 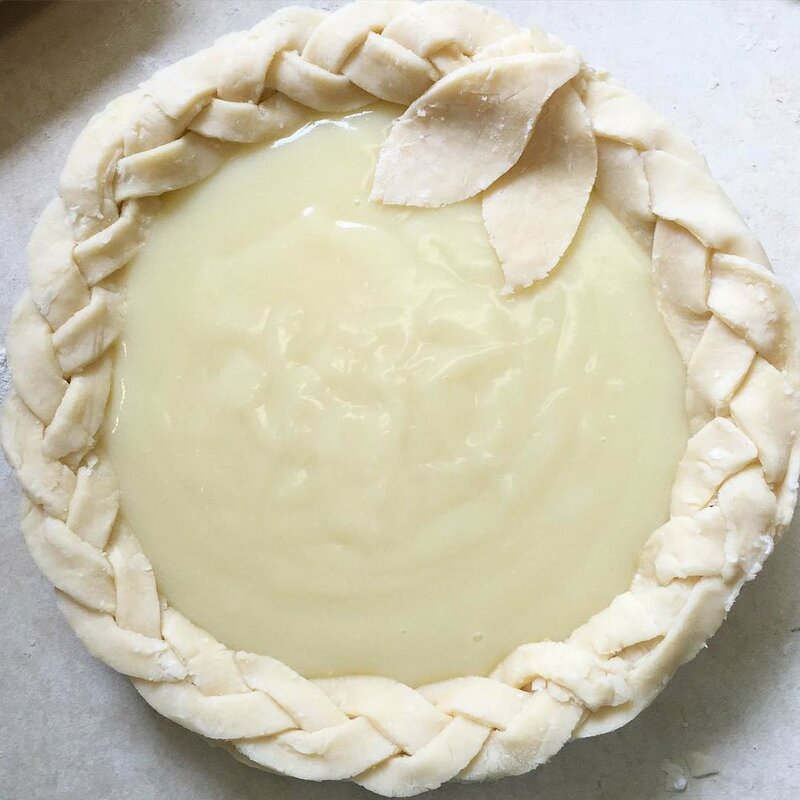 Pop the pie crust on and then bake as usual. I did not expect it to be as fantastic as it was! I am seriously debating making it again even though there are still a crazy amount of pies still to attempt! For the next pie I actually had to make some cheese. Ok. I didn't have to make it, but store bought ricotta is so disappointing and quite expensive. 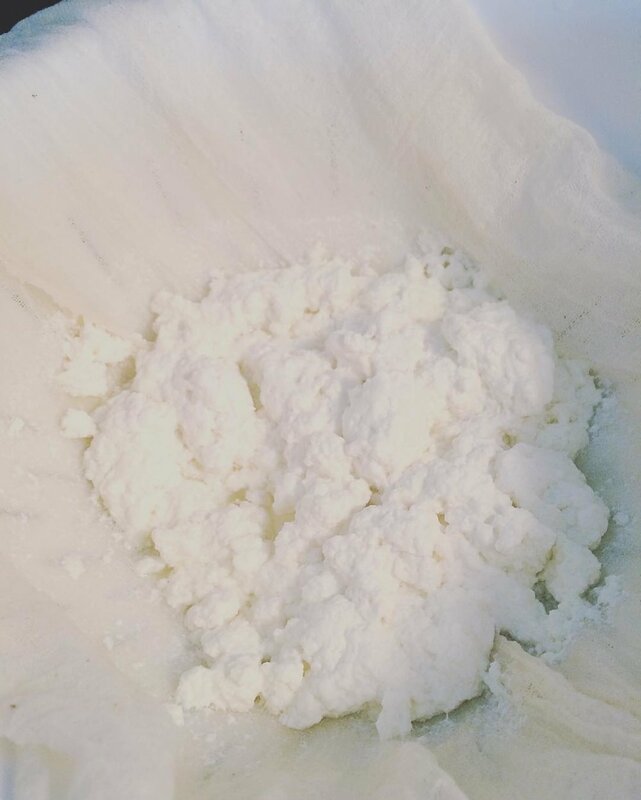 Making ricotta was something I have always wanted to try so I took this as an opportunity to learn. It was so simple! Heat milk. Add lemon juice. Wait until curds separate (you can see the stages of separation in the photo above). Scoop them out and strain it through a cheesecloth. Unfortunately that was the best part of the pie right there. You make a custard from the ricotta and then pour it into a graham cracker crust (not my favourite) over some raisins (gross), and serve with raspberry sauce (weird). I would have rather just have the custard in the graham cracker crust and forget about the raisins or raspberry sauce. That would have been good. I also thought about drizzling it with maple syrup but forgot to try it. That would have been good. Oh well. Not all the pies can be amazing, I guess! To be honest Mr. Forager actual liked this one but agreed that the raspberry sauce was a weird choice to pair with it. Other pies I made but forgot to photograph were the 'Fresh Cherry Pie', 'Cherry Turnovers', and 'Apricot Turnovers'. None were all that special. 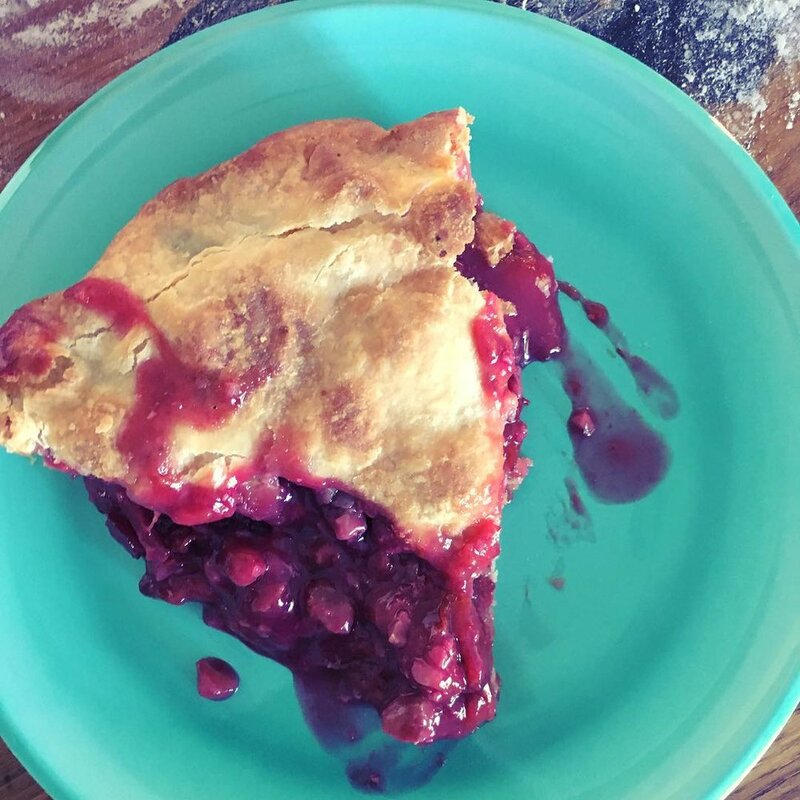 I am still looking for the perfect cherry pie recipe. They all seem a little one dimensional and/or cloying. I received some sour cherries from a neighbour so I have great hopes for the pie I make with them. Maybe I can find the secret with them!